Spotlight On . . .Max Spann, Jr. This month’s Spotlight On profiles Max Spann, Jr. of Max Spann Real Estate & Auction Company. A renowned presence in the industry for decades, this company deals with all types of real estate nationwide with a focus on the Northeast sector. We spoke to Max Jr. on a variety of topics including online sales, determining marketing budgets and the current market landscape. PA: How would you describe your organization? Everyone under the sun is in vacation mode. Summer is in full swing, the weather is record-breaking hot, and everything around you is moving a little bit slower. This is the prime time of year that real estate seekers long for that special getaway property – not just a lake house or beach condo, but a full-fledged ‘great escape’ sanctuary. This week PA is checking out properties that fully deserve this title. 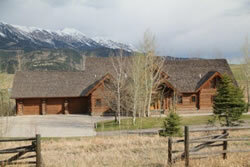 Take a look at Freedom Realty Exchange’s 7-bedroom, 5-and-3/4 bathroom custom home with guest house located in Bozeman, Montana. Weighing in at 8,759sf on 40.15 sprawling acres of pristine mountain land, this heavenly habitat is packed with amenities including vaulted ceilings, hardwood floors, granite countertops, stone fireplaces and an upstairs theater room. Since this property is adjacent to a nature conservancy, potential owners can be rest assured that their spectacular views will not be disturbed. PA is picking this one for its stellar wraparound deck that offers striking views of the property’s trout pond, babbling stream and vast open space. Bid deadline is August 10th.